(quercus suber L), a noble tree with very special characteristics that grows in Mediterranean regions such as Spain, Italy, France, Morocco, Algeria and, most particularly, in Portugal, where there are more than 720 thousand hectares of cork forests, as well as a cork industry of considerable economic importance. It is an astonishing tree, very long-lived and with an enormous capacity for regeneration. It can live on average 150 to 200 years, despite its bark being stripped around 16 times during its lifetime, at nine-year intervals. Cork is the bark of the cork oak (Quercus suber L), a noble tree with very special characteristics that grows in Mediterranean regions such as Spain, Italy, France, Morocco, Algeria and, most particularly, in Portugal, where there are more than 720 thousand hectares of cork forests, as well as a cork industry of considerable economic importance. But it is, above all, a material that is one hundred percent natural, recyclable and reusable, essential qualities in a more environmentally friendly and less polluted modern society. The life cycle of cork as a raw material starts with the extraction of the bark from cork oaks, the so-called harvesting or stripping which is carried out during the most active stage in the annual growth of the cork, from mid-May or early June to the end of August. However not many people know that it takes 25 years for cork oak trunk to start to produce cork and be profitable. Each trunk has to reach a circumference of 70 cm when measured at 1.5 metres from the ground. From then on, the cork can be harvested from the tree for on average 150 years. The first stripping, which is known as "desbóia", produces cork of a very irregular structure which is too hard to be easily handled. This is the so-called virgin cork which will be used for applications other than cork stoppers (flooring, insulation etc. ), since its quality is far from that necessary to manufacture stoppers. Nine years later, the second harvest produces material with a regular structure, less hard, but still not suitable for cork stoppers - this is known as secondary cork. It is from the third and subsequent harvests that the cork with the best properties is obtained, suitable for the production of quality corks, since its structure is regular with a smooth outside and inside. This is the so-called "amadia" or reproduction cork. From then on, the cork oak will supply good quality cork every nine years for around a century and a half, producing, on average, 15 to 16 bark strippings throughout its life. 1. Opening. A vertical cut is made in the cork, choosing the deepest crack in the cork bark. At the same time, the edge of the axe is twisted so as to separate the outer from the inner bark. The degree of difficulty of extraction can be gauged from the 'feel' of the axe. When the edge of the axe is applied to the strip, a hollow sound of tearing is heard if the cork is going to come off easily. If it is going to be difficult, the axe gives off a short, firm, dry sound. 2. Separating. The plank is then prised off the tree, by inserting the edge of the axe between the strip and the inner bark. The axe is twisted between the trunk and the cork strip to be extracted. 3. Dividing. A horizontal cut defines the size of the cork plank to be removed and what is to remain on the tree. During dividing, the inner bark is frequently marked and these mutilations can sometimes alter the geometry of the trunk. 4. Extracting. The plank is removed from the tree with care so that it does not split. The larger the planks extracted, the greater their commercial value. The removal of entire planks depends on the skill of the workers. After the first plank has been stripped, the operation is repeated over the whole trunk. 5. Removing. After the stripping of the planks, some fragments of cork remain attached at the base of the trunk. To remove any parasites in these "wedges", the debarker gives them a few taps with his axe. Finally, the tree is marked, using the last number of the year in which the extraction took place. Seasoning period. 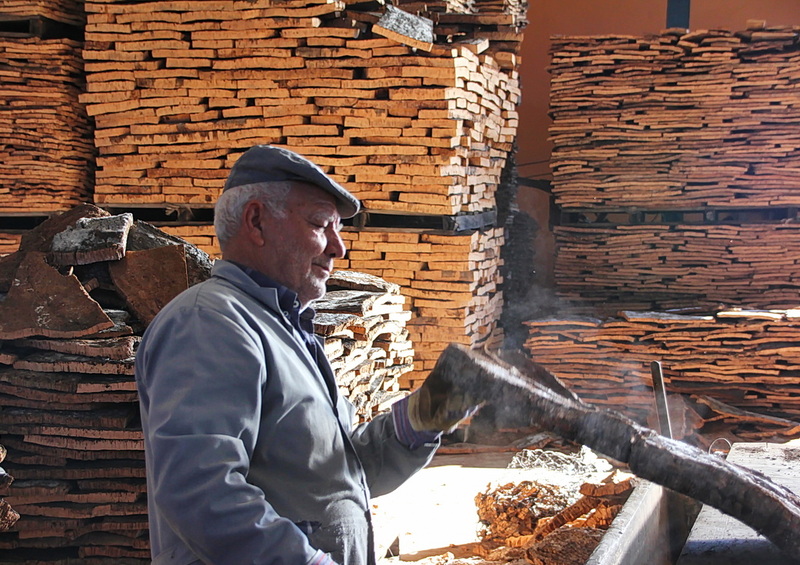 After the harvest, the cork planks are stacked in piles either in the forest or in yards at a factory. There they remain exposed to sun, wind and rain. All these piles are constructed taking into account strict specific rules (defined by the International Code of Cork Stopper Manufacturing Practice - ICCSMP), so as to allow the cork to stabilise. The piles should be stacked on materials that do not contaminate the cork and prevent contact with soil. Wood, for example, is expressly prohibited because it can transmit fungi. During this seasoning period, the raw material matures and the cork stabilises. According to the ICCSMP, the seasoning period for the planks never should be less than six months. to improve flexibility and elasticity. Before boiling the cork cells are collapsed and wrinkled, but during this process the gas in the cells expands. As a result, the structure of the cork becomes more regular and its volume increases by around 20 per cent. The boiling is an operation prescribed by the International Code of Cork Stopper Manufacturing Practice. An operation which, besides improving the internal structure of the cork, also ensures that the microflora is significantly reduced. Several cork stopper manufacturers use complementary procedures to achieve improved disinfection. Some have introduced, for example, controlled boiling processed in a closed environment. Stabilisation. After the boiling, a period of stabilisation of the cork takes place. Only after this period, which lasts for two to three weeks, are the planks selected. Stabilisation serves to flatten the planks and to allow them to rest, in order to reach the necessary consistency for their transformation into cork stoppers. Slicing. After the stabilisation period, the cork planks are cut into strips slightly wider than the length of the cork stoppers to be produced. Punching. Punching is the name of the manual or semi-automatic process of perforating the strips of cork with a drill. A cylindrical stopper is thus obtained within the dimensional limits prescribed. All the waste from the punching stage are used for cork granulate. Cork that is not directly used for top-of-the-range natural cork stoppers will be processed to make granulate for technical stoppers (stoppers designed for bottled wines to be consumed within 2 to 3 years). Or also to manufacture cork agglomerate products which are used as insulation and construction materials. Rectification. After the punching, rectification is designed to obtain previously specified final dimensions and to regularise the surface of the stopper. Selection is the operation designed to separate the finished stoppers into different grades, which are determined by automatic scanning of their surface. In some cases, the selection is done by visual inspection. During this stage, besides the definition of grades, defective stoppers are also eliminated. Washing. After rectification, the stoppers are washed using either hydrogen peroxide or paracetic acid. This cleans and disinfects the stoppers, but there are other methods also used such as microwaves or ozone. After washing/disinfection, the moisture level is stabilised, thus maximising stopper performance as a seal and simultaneously reducing microbiological contamination. The cork stoppers may also be colmated. Colmation seals the surface pores of stoppers (lenticels) with a mixture of cork powder produced by the rectification of natural cork stoppers. Colmation improves the presentation of stoppers that have many lenticels and helps to obtain a better seal. Printing or Branding. This operation is carried out according to customers' specifications as to the type of marking to be applied. The methods used are ink printing (with food quality ink) or traditional heat branding. After branding, they are given a paraffin or silicon surface treatment to make them easier to insert and extract from the bottles. Transport. Once their production is finished, the stoppers are packed in plastic bags with SO2 (sulphur dioxide), a gas that blocks microbiological proliferation. Only then will they be delivered to wine or spirits bottlers.